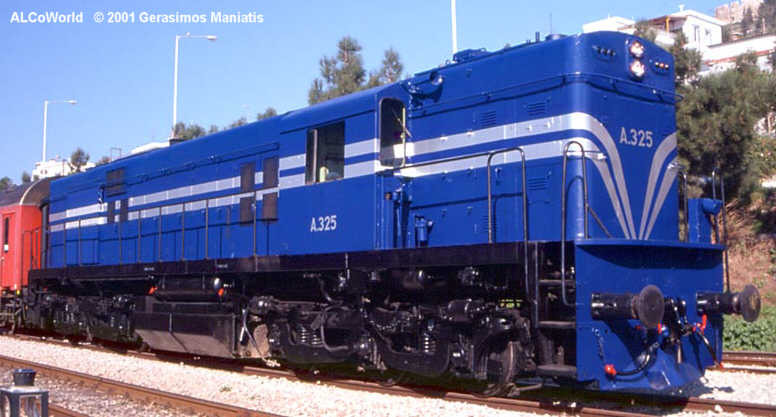 The preserved Alco's in Greece are repainted in original livery by members of the Greek Railfan Association (S.F.S). A-326 is seen on the Aghios Ioannis turntable just after end of work, April 23rd 2000. The A-321 series can be understood as a kind of hood version of the ALCo World Locomotive. They're assigned to Thessaloniki from where they commonly go to Kozani and Alexandroupolis - sometimes even Athens. 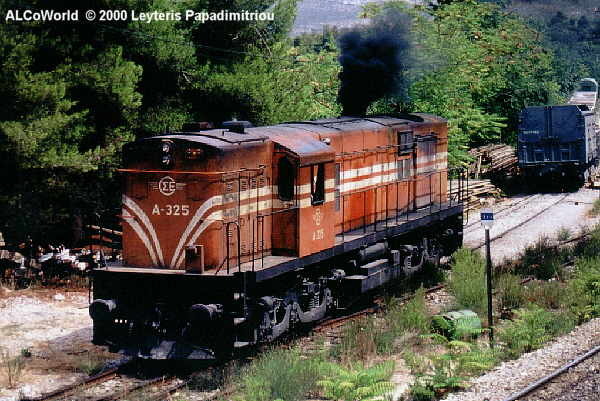 The DL543 model was the last original ALCo product for Greece. Two units are scrapped so far, first was A-323, then A-321 suffered a derailment in January 98 and wasn't to be rebuilt again. It rested minus trucks and prime mover in Thessaloniki depot before it was cut in two and loaded on a flatcar, see photo in the Gallery. This class is well behind its big time. They saw all duties ranging from local freight and passenger up to express trains to Athens. In 1998 they were scheduled to be withdrawn. The five remaining units were on the active side until late, but they were increasingly replaced by the MLW class A-451 which was itself freed by the new ADtranz class A-471. But things are different a year later: A-322, 325 and 326 have been reported active in June 99, with A-322 being assigned to Strimon. On the last May weekend, A-322 worked as helper in front of an ADtranz diesel during an excoursion of the SFS (see Gallery). In September 1999 the regular service of the A-321 class ended. 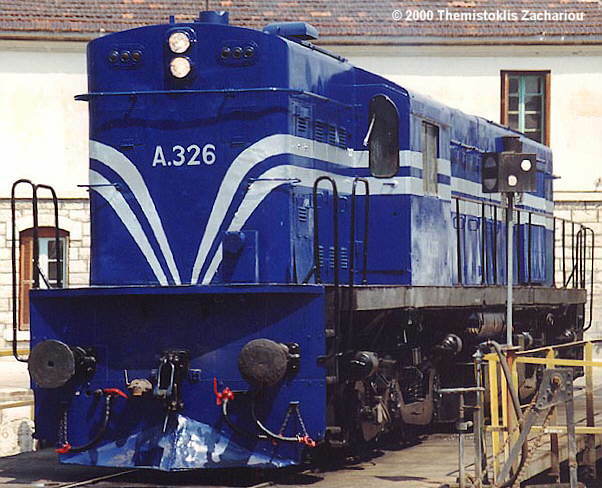 News from April 24, 2000: Like A-302, the A-326 was restored and repainted blue/silver (see above). Meanwhile (Nov 2000) A-325 operates almost daily from Athens while A-326 sees some service from Thessaloniki. A-325 is now painted blue/silver, too - see below! A-322 and 324 are stored at Thessaloniki. A-325 has finished work and returns back to Athens. Sfendali station, September 9th, 2000. A picture from the excursion of the Friends of the Rail association to Halkida on Sunday 04/02/2001. Our train was arranged to be headed by A-325 which was just repainted to its original colors. It was performing very well, besides the 3 coaches were not a heavy load for its power.